Goodreads summary: The creative writing teacher, the delivery guy, the local Starbucks baristas, his best friend, her roommate, and the squirrel in the park all have one thing in common — they believe that Gabe and Lea should get together. Lea and Gabe are in the same creative writing class. They get the same pop culture references, order the same Chinese food, and hang out in the same places. Unfortunately, Lea is reserved, Gabe has issues, and despite their initial mutual crush, it looks like they are never going to work things out. But somehow even when nothing is going on, something is happening between them, and everyone can see it. Their creative writing teacher pushes them together. The baristas at Starbucks watch their relationship like a TV show. Their bus driver tells his wife about them. The waitress at the diner automatically seats them together. Even the squirrel who lives on the college green believes in their relationship. 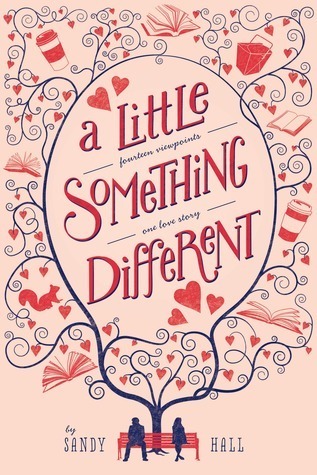 A Little Something Different is just as cute and adorable as the cover promises! And with all the different POVs, it is definitely something different! Sandy Hall brings us a developing love story that EVERYONE (even a squirrel) has an opinion about and I enjoyed some POVs more than others. I really liked the squirrel, because basically it is the cutest. And the Starbucks employees and the lady at the diner. I thought their creative writing teacher was a little over the top, but oh well, it was still fun. The only thing that I can fault with so many POVs, is that you never delve really deep into any of the characters, but for this story it served its purpose and was basically just pink and fluffy and yes to this couple who even orders the same take out without consulting the other first. I was REALLY wondering what was up with Gabe, cause like the summary says, he seemed to have issues. But it was a very good explanation and like always, I was just wishing for them to communicate! But overall this was an adorable, quick read and if you're in the mood for fluff, you should definitely pick it up! I'm not a huge fan of romance but this sounds quite delightful! This sounds like a good one! I think the cover is just too cute <3 I think having too many POVs can be a bit overwhelming at certain points, but I would like to try this! I think it's the perfect light hearted read for a long travel or something.